People protest against the July 15 coup attempt on Istanbul's Bosporus Bridge, July 21, 2016. COLUMNS Why did Erdoğan win? COLUMNS What does Turkey want in the Balkans? COLUMNS What's at stake in the June 24 elections? This weekend marks the two-year anniversary of the July 15, 2016 coup attempt in Turkey. Orchestrated by Fetullah Gülen and his terrorist group, officially known as Gülenist Terror Group (FETÖ), this assault claimed 250 lives and was survived by more than 2,000 people with injuries. Over the course of several hours, a number of Turkey's strategically important institutions, including the presidential complex, the Parliament, and police and intelligence headquarters, came under attack by what appeared to be an occupying force.In the aftermath of our victory against the enemies of democracy, ensuring that the same tragedy would never happen again, proved to be a challenging yet crucial task. In this sense, the past two years have been a trial by fire for our country. On that fateful night, millions of Turks made history by risking their own lives for the well-being of the entire nation. Together, as free citizens from diverse ethnic, political and cultural backgrounds, we pulled through and defeated the coup plotters. It was a proud day that future generations will remember as a historic moment.Turkey was able to absorb the shock of the July 15, 2016 coup attempt thanks to President Recep Tayyip Erdoğan's strong leadership, the Turkish people's firm commitment to democracy and the strength of our country's institutions. Shortly after the failed coup, the country declared a state of emergency in order to get to the bottom of what happened and prevent future attacks against Turkish democracy. After two years, the state of emergency will be lifted next week, as promised by President Erdoğan ahead of the June 24 elections, in which he clinched re-election with 52.6 percent of the votes.If the July 15 coup attempt took place in a country with weaker institutions and lesser democratic culture, their economy would have collapsed immediately. The political process would be derailed and social peace would be at risk. In this regard, everything that happened between that murderous assault on Turkish democracy and today must be analyzed carefully, as it attests to Turkey's resilience as a country. Despite the attempted coup, our country remains the only NATO ally that fights three terrorist groups simultaneously, dealt heavy blows to the PKK and launched a successful ground offensive against Daesh strongholds in Syria. Consequently, there has been no major terror attack in Turkey since December 2016. Against all odds, the Turkish economy became the world's fastest-growing economy in 2017 and created hundreds of thousands of new jobs. During the same period, a constitutional referendum and presidential and parliamentary elections were held without any problems. At the same time, our political institutions and social peace remained intact. Over the past two years, Turkey's perfectly reasonable efforts to eliminate the threat of another coup attempt have been taken out of context by Western reporters, which created a major gap between media coverage and the facts on the ground. In truth, the state of emergency, which is a constitutional mechanism to protect our democracy against most serious threats, has not affected the daily lives of ordinary citizens. Many powers that the Constitution granted to the government under the state of emergency were never exercised. Turkey did not introduce capital controls nor impose restrictions on domestic and international travel. Ahead of popular elections and the 2017 constitutional referendum, various political parties could campaign without facing any type of restriction. 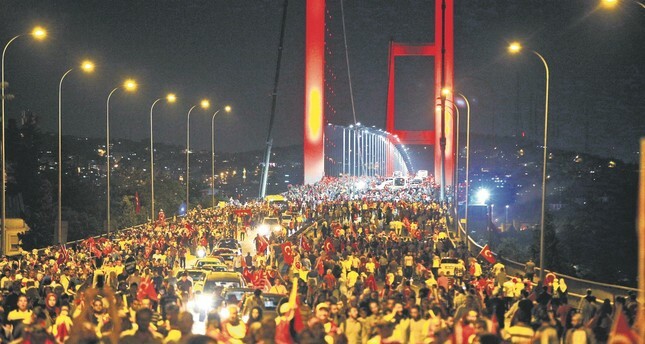 All in all, we, the Turkish people, came together and got back on our feet as a nation. Nothing will ever change that fact.Today, the Gülenists' invasion of the hearts and minds of honest, hard-working Turks have completely ended. We have broken FETÖ's siege on our country's public institutions and civil society. At the same time, we have taken steps to prevent efforts by this terrorist group to poison the people around the world under the guise of education. Specifically, the Turkish Maarif Foundation has been tasked with taking back our nation's overseas schools and creating new educational institutions abroad to ensure that our country remains a beacon of hope. Also, foreign governments have developed a better appreciation of how seriously Turkey takes this issue as well as the ways in which Gülen and his servants could put the security of host nations at risk. Needless to say, our efforts to bring the perpetrators of the July 15 coup attempt to justice will continue with determination.